Need something to listen to while waiting in line for The Force Awakens tickets? Apple Music's got you covered with newly launched Star Wars Radio. The custom streaming station not only contains the essential tracks from John William's iconic score, but also tosses in additional sound effects to set the mood, from the blips and bloops of droids to the familiar (though typically inaccurate) 'pew pew' bolts of Stormtrooper blasters. 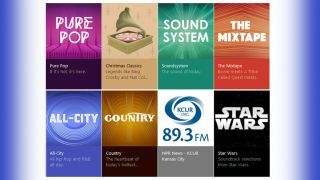 Star Wars Radio is available on both the desktop and mobile clients for Apple Music, though Apple has noted that the station is not available in all regions outside the US. Apple Music isn't the only service tying in with the release of The Force Awakens. Facebook Messenger stickers, Twitter emojis, Chrome's spoiler-dodging browser extension, character-themed Google Cardboard headsets, a brand-new Battlefront game, and Spotify are just a few of the features and services building up hype for the seventh chapter of the Star Wars saga.